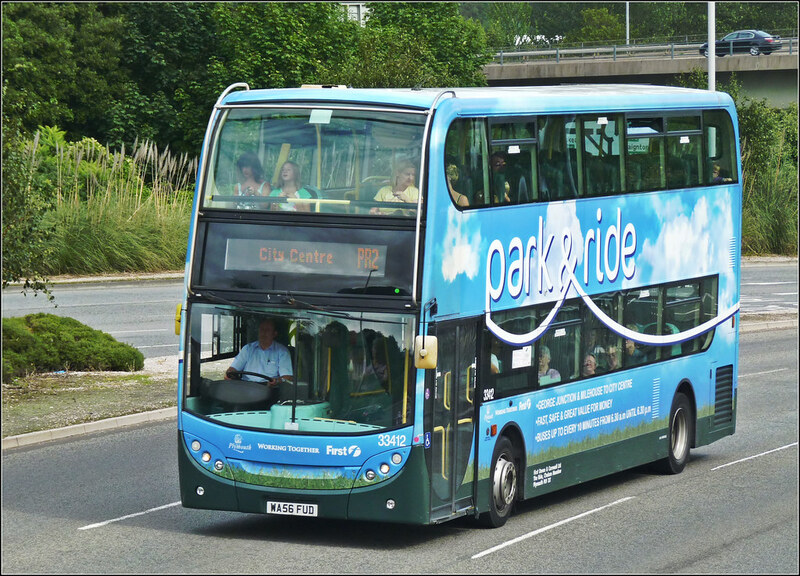 Well it seems that the old Park & Ride Enviro's have all but disappeared from Plymouth. The new 12 reg buses are now in charge in their new First Group livery so the clouds livery is no more. At least 33412/13/14/15 are already at Weston Super Mare. There may be one or two left in Plymouth but these will soon be gone. 33416 turned up on school service 809, still in the blue and white sky based livery, but without the park and ride lettering. If you do see one out and about - wave good bye! These buses have served Plymouth very well and are still very comfortable well appointed buses. Initial reports state the new ones, although decent buses, are not as well appointed. I shall be having a go shortly! The 12 plate doesn't have the radiator at the rear n/s, perhaps that's something to do with a lack of air-con. Also the headlights are laid out different. I dout that the new buses will be in Plymouth very long. Also some intresteding news on South England Bus Scene about First moving out of North Devon guess who is the new service provider? Have you got 'issues' Responding to Emails? (dbg @ plymothiantransit.com) Pictures Sent, News etc, Never a Shred heard in Return..... Poor Show. New deckers - what have you sent? I dont think I have missed anything? ?